Some lovely organ music played on a church organ on the record Organ Safari Lituanica (INTONEMA int019). 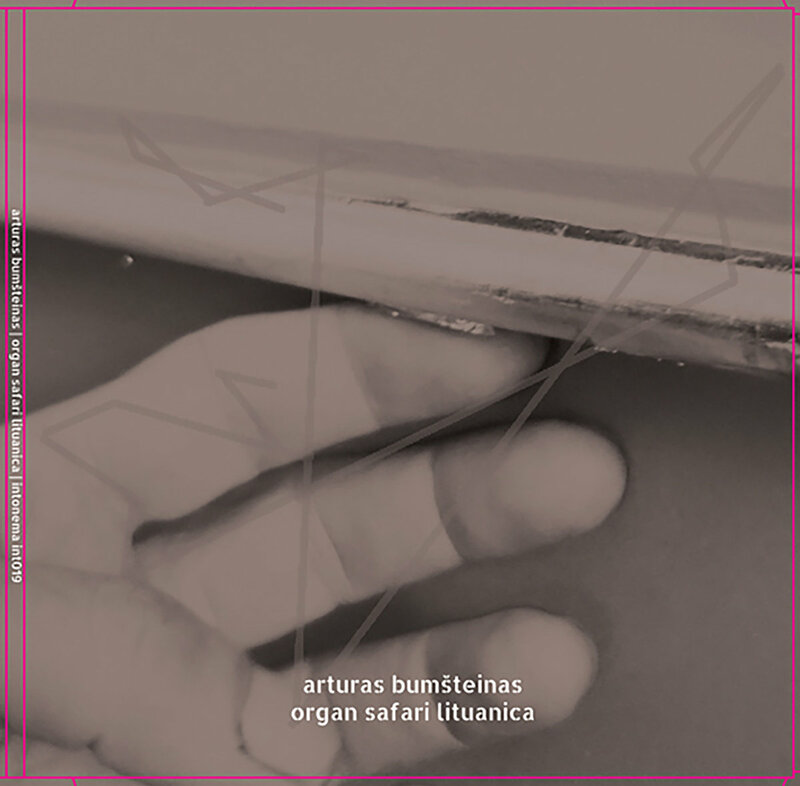 The release is credited to Arturas Bumšteinas, the excellent Lithuanian composer and conceptualist, although the actual organ improvisations are played by Gailė Griciūtė. From what I can make out, the concept is down to Arturas Bumšteinas…it’s part of a much bigger project which he calls Organ Archipelago. Five radio programmes were commissioned by the Australian Broadcasting Corporation; these broadcasts make use of an archive of organ recordings which Bumšteinas has previously gathered from Lithuanian towns and villages, and then extended the music into improvisation, and radio drama. The improvisation part is supplied by five musicians from across the globe – Africa, Japan, and Russia are all represented. There’s also some fragmented story-telling going on, using voice actors, and some of it seems to be based on a book by Arthur Russell Wallace. So many layers. This is what we’ve come to expect of Arturas Bumšteinas…he’s a right one for mixing up many cultural sources of information into a dense wodge of conceptual spaghetti, and expecting the audience to keep up with him as they untangle the strands. Or perhaps he’d rather liken it to baking a layer cake, and we have to roll up and cut ourselves a slice, evincing surprise as each new stratum of jam and cream is exposed to our hungry eyes. The above is not fully represented on Organ Safari Lituanica however, and I just added all that in to give you some context. For this record, Arturas Bumšteinas continues to claim “composition” as a credit, but as noted all the music is actually played by Gailė Griciūtė. I suppose it’s really a Gailė Griciūtė album, but maybe we’re entering into a John Cage / David Tudor area of similar tension, and I don’t wish to cause trouble. Gailė Griciūtė is a talented composer, visual artist and conceptualist in her own right. I’m not here to review her music to day, but if you visit her website the first thing you see is an old upright piano against a decaying plaster wall. Right on, girl! I think that image speaks volumes about her musical plan. To the left of that image you see a picture of the woman herself, and the poise and dignity with which she comports herself throughout life is evident. Some of her exhibits, as described on other pages, are highly intriguing multi-media installation pieces, involving sculpture, projections, live performances and pre-records…and seem to be based on interesting scientific ideas and observations. For instance: “Linger On Your Pale Blue Eyes explores the quest for freedom of a scientist through observing the rhizomatic unfolding of her inner monologue.” Not often we get a Lou Reed lyric and rhizomatic unfoldings together in the same sentence. Judging by her performances here, evidently she’s also a great keyboard player and improviser, and I could happily listen to this strange curlicued music all day, if required. Really digging the weird mixed chords and unexpected explorations of melody lines. Invention just seems to pour out of her. Excellent stuff. I’m still unsure where the Organ Archipelago concept comes in to all this. Neither can I interpret the odd cover image, which shows a detail of a hand whose fingers are picking at a piece of decayed wood. Perhaps this summarises (or even documents) what was found when they did the tour of the Lithuanian churches. Maybe all the organs are decaying. That would make a good observation about the state of the world today. Our organs are atrophying, like our brains and our hearts. From August 2016.